The E-Scan from MyoVision is a computerized spinal exam. Think of it as a picture​​ of your back muscles. MyoVision utilizes technology similar to the EKG. 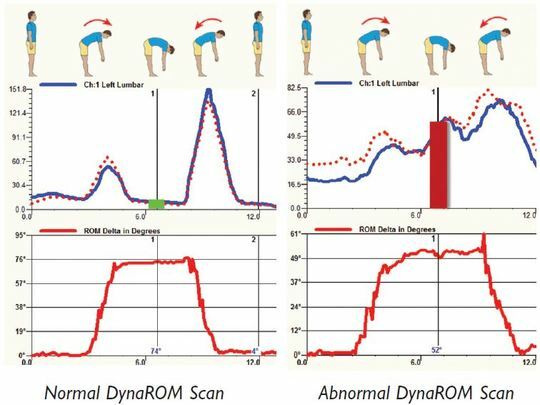 Instead of measuring heart muscle patterns, we measure the muscular compensation about the spine. The MyoVision exam is an electronic form of palpation, providing an objective means of quantifying an important measure of spinal health. The exam takes only a couple of minutes. ​DynaROM is used to test for pain as a result of soft issue injury from an auto accident or work injury. Sensors are placed on the body to measure both how far you can bend, and your muscle guarding response. You are required to perform various motions as the sensors graph these measures. This data is used to aid in establishing need for care and tracking your progress over time.